Day 3 of Salad Week Series. It took me a full day of focused creativity to make it happen, but it was so worth it. This week has been full of writers’ block, stalemate, and mental exhaustion, leaving me a bit depleted in my efficient work flow. I started with 10 ingredients, edited down to 7 and ended up with something much simpler than I anticipated. You know what they say: Less is More. And in this case, it wonderfully applies. Cauliflower is nothing new but it has hit the food magazine pages as if it were 1982 when the Cabbage Patch Dolls were introduced into the main stream market. We all know the yellow-hued vegetable. We all love it. But do we all defer to using it the same way? I’m sure of it. Its relatively simple structure leaves little room to want to do more with. So we purée it. It’s super easy and super fast that way. It’ll pair well with a lot of meats. And ultimately, a great low-fat food. So I’ll jump on the bandwagon and share some goodness made with this simply glorious head of florets. At least the white one. There are a few other varieties we can opt for, but for the sake of common knowledge and accessibility, let’s go with this one. This salad is another winner. After the grilled chicken with hummus and cilantro aioli salad, which was a bit on the acceptable heavy side, I had to go light today. It’s all about balance. 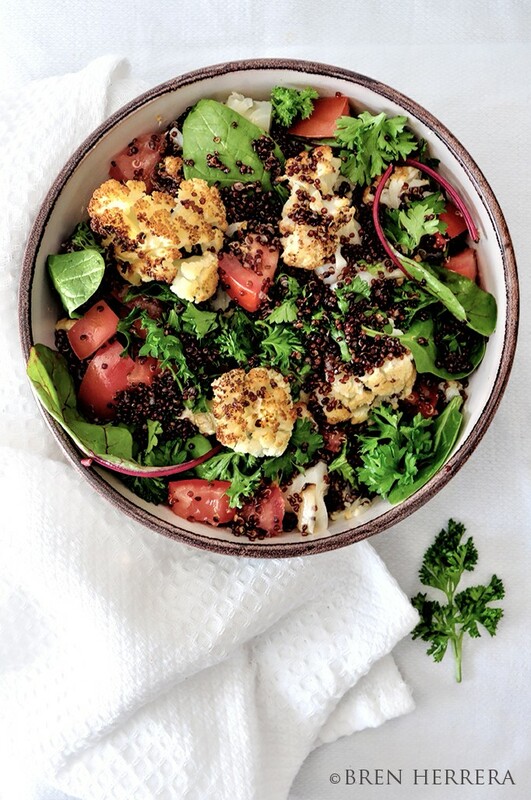 Sweetly buttered and roasted cauliflower countered with toasty quinoa and soft tomatoes with the perfume of parsley, made this a healthy option for anyone looking to cleanup for a few days. Arguably, cauliflower is a culinary unsung hero. But it deserves all the hype it’s getting. In addition to being extremely easy to cook and work with, it’s every girl’s dream low-carb diet food. It also had a great amount of fiber which is ideal for filling us up in the best way. In keeping it simple, I still wanted texture and flavor. Quinoa on its own can be lackluster but like rice, just too essential. A cup-full goes a long way in this ensalada. Use the super greens as a filler, especially if you’re missing out on your green allocation for the week. So while the salad itself if very simple — incredibly fresh and en trend — the dressing is where you’ll have room to get all the flavor in. Go light, but don’t sacrifice flavor. Instead of throwing nuts in the salad, I thought it’d be great to take raw walnuts and mix them with 100% pomegranate juice. When I find myself on a roll without distractions, I make a lot things happen. Since this Salad Week project is mostly personal, for our mutual enjoyment, and not for client work, I’m leaning toward being a little more relaxed with my approach and technique. But I let it flow here! The stalk of the roasted cauliflower made it into my processor for the dressing. That gave it the creaminess I needed. The juice and olive oil weren’t enough. Adding agave didn’t complete it either. But the roasted stalk? Perfection. A real buttery, creamy, and nutty dressing made this salad the winner I want it to be for you! Have fun with this one. Add grilled chicken if you like. Pomegranate seeds (arils) will work, too, for some crunch. Skip the cheese. At its core, this salad is meant to be simple and clean option when you have a hard time getting in your vegetables but need something attractive and doable. I hope you enjoy this one and come back Sunday and Monday of next week for at 4pm EST for more! Cheers to eating better, cleaner, and leaner! 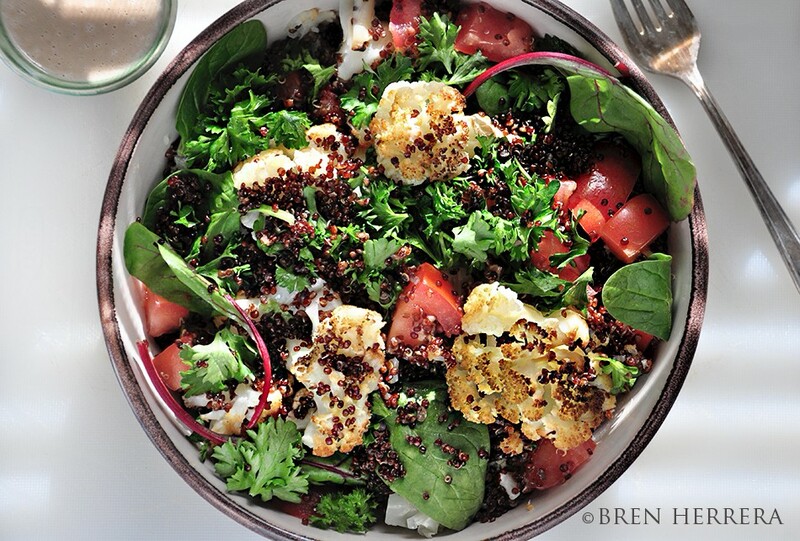 Here are a few fun salads for you to try! Preheat oven to 400F. Par cook whole cauliflower in salted water, approximately 15 minutes depending on your range. Strain completely. Place on parchment paper and lather in butter. Wrap whole cauliflower in parchment paper and roast for 30 minutes or until most of top layer is charred. Remove from oven and let cool. Break off florets. In large mixing bowl, add cauliflower, quinoa, tomato, parsley, and super greens. Add salt to taste. Toss well. Add dressing and toss well again. Let cauliflower stalk to cook. 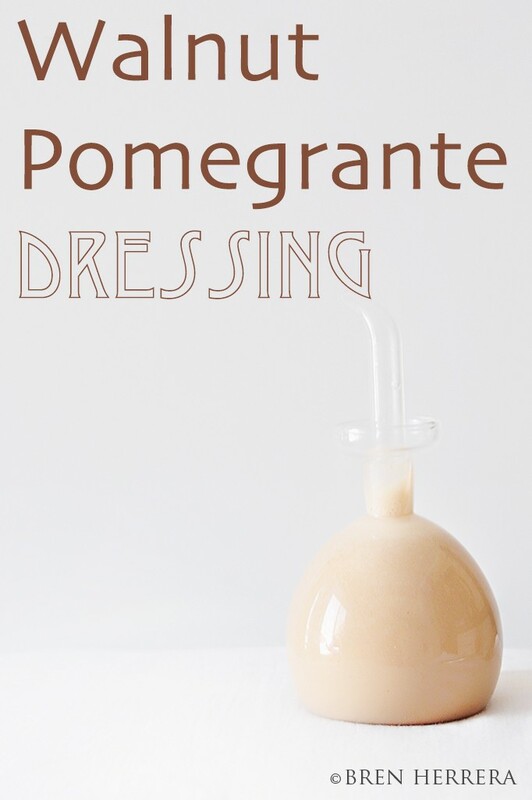 Add pomegranate juice and walnuts to food processor. Pulse for one minute or until walnuts are fully broken down and well incorporated. Add cauliflower and agave. Slowly add in olive oil. Add pinch of salt if needed. A fabulous and scrumptious salad! 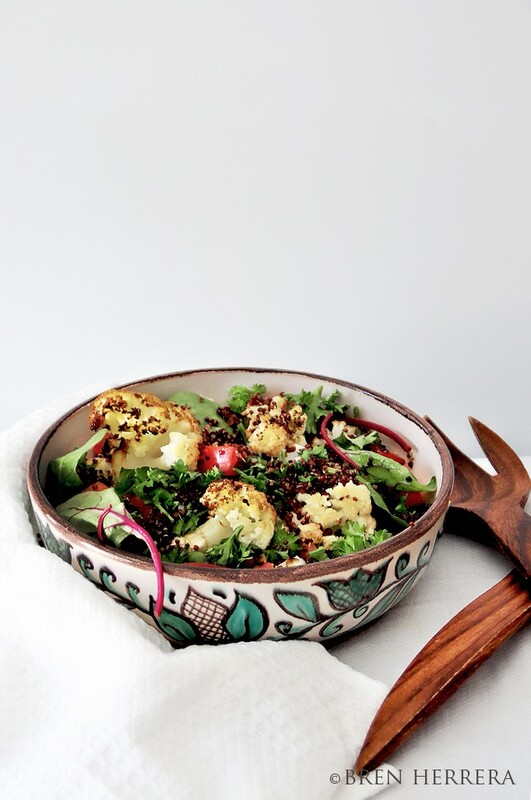 Just loving everything about this salad cauliflower quinoa pomegranate … it’s all here in one bowl! 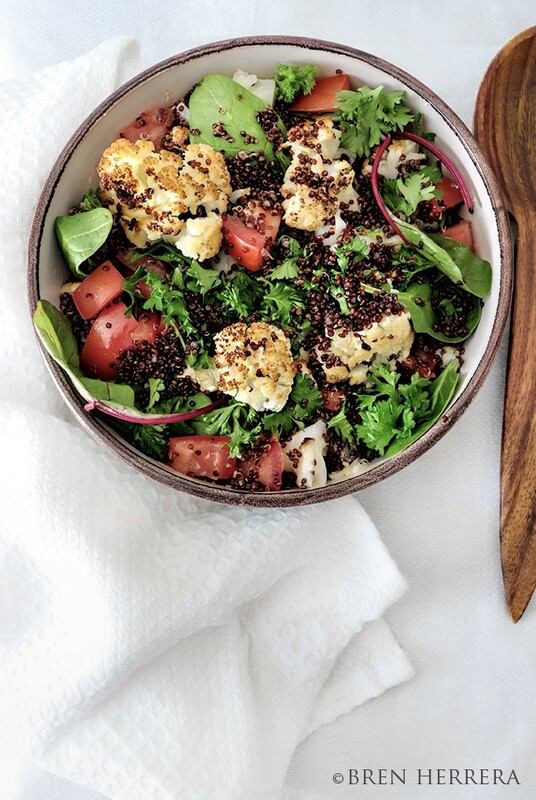 This salad is right up my alley as I love roasted cauliflower. And the bowl you used here is so pretty!